One of my now previous bikes, this Sport 1100I was one I loved very much. I had the opportunity to buy one direct from the importers at one stage, so hurriedly arranged a loan and did so. I bought the bike with the full intention of playing with it, taking two years to complete. When finished, I sold it and got a new play toy. It did look very nice when finished. Here's a photo. The mods carried out were not what I had originally intended, as the inside of the engine didn't allow what I had in mind. Instead of welding up the combustion chambers, as they are just too big, the main change for better combustion was twin spark plugs per cylinder. A smaller, c series plug was fitted to the inside of the cylinder head, directly across the chamber from the std outside plug. This requires the removal of the inner stud and its replacement with a cap head bolt of appropriate length. A new oil gallery entry needs to be fabricated also, and the std entry point welded up. This is only a concern for square fin engines, as the older round fins have different oil feeds. All this is relatively easy for the experienced machinist. The heads were then flowed and mildly ported and fitted with different shape valves. The differences could very slightly be seen on the back of the valve head, but the flow difference was very obvious. The porting consisted of minor work to the short turn radius and the valve guide boss. About 2 hours in total, for a flow improvement all up of over 15%. The heads were then milled 1mm to reduce the chamber volume. When combined with 0.5mm thinner copper head gaskets ( 0.7mm ), the compression ratio had risen from around 9.3 : 1 std to 10.5 : 1. Much better. Modifications to the short block consisted of polished and peened rods and an oil screen between the crank and sump. This didn't have the effect I was hoping for ( dyno improvement negligible ), mainly I believe to the internal structure inside the sump that the Sport 1100I and Daytona RS engines have. There is already a fair amount of coverage between the crank and the oil below. I would like to try this kind of mod in an early open sump engine, like the Lemans I intend to buy one day, and expect it would work better there. The exhaust system was one I made myself from mild steel exhaust tube which was then HPC coated in satin black. The style of the system was kind of Staintune/Termi based. The tubing was 45mm from head to x-over, and then 50mm from x-over to mufflers. The mufflers used were Hindle, originally intended for a Suzuki TL1000S, provided at a very good price by the guys at Dynobike. This was fitted prior to the other engine mods, and is stage one of the dyno graph. Whether this was any better than my previous system, consisting of std header pipes, a double-Z style x-over ( where each pipe went from one side to the other ), std muffler pipes and the Hindle mufflers is debatable, but it did look much better. The inlet side was standard apart from removing the airbox lid. The rubber ram tubes were mounted to little plates I fabricated to keep them in their original places. Although this mod made no difference on the dyno, I could feel it on the road. The lovely big airbox stayed in place. The ecu was fitted with a custom chip from FIM, and included revised fuel and ignition advance maps. It worked very well. As a side note, this bike was always set up with the air bleed screws turned in full closed. This made the low speed running much nicer. The idle mixture was set around 3 to 4 % CO, where it seemed very happy. Ignition itself was handled by two coil packs intended for a Holden VP Commodore. These twin output, non polarity specific coils were just hooked up to the standard coil primary wires, with quality automotive style leads running the secondary side. No resistor caps were used. This system worked excellently from day one, contrary to what some predicted. Plug gap was stretched to 1mm, without any apparent problems. With the twin plugs and higher comp the bike would idle at 1000 RPM with hardly any side to side rocking. 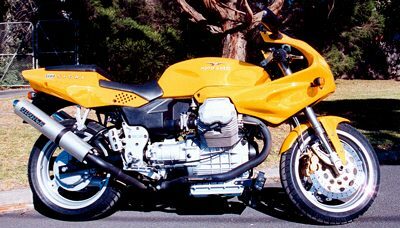 Very un-Guzzi indeed. Down low it was smoother and more responsive, and went better everywhere. Fuel economy increased from the original 14 km/l average up to around 18 km/l average. On a cruise it would do over 20 km/l. From the dyno graphs below you can see that the standard exhaust is very good at making high RPM power. The green line is for the standard bike. The blue line is the bike with my exhaust fitted and an FIM Staintune chip, with slightly modified mapping. This shows the value of removing the std exhaust, particularly the central round x-over ( which is even greater to the on road feel than the dyno suggests ). The mufflers themselves are not as much of a restriction, but are better gone. The red line is with the twin plug, hi comp and ported heads, exhaust, airbox lid removed and the custom FIM chip. The way the bike pulled in this configuration was just wonderful. Coming out of a corner in third at 4,000 RPM and just holding it open to 7,500 RPM before getting on the brakes for the next was something I enjoyed doing very much. As were full throttle, through the gears to 7,500 RPM runs. A very addictive power delivery that was just plain bad for my licence. From the torque curve at the bottom you can see just how much stronger the bike was. The angle of the curve around 4,000 to 4,500 RPM was particularly noticeable on the road. Getting used to the new power delivery caused more than a few hard braking moments before my brain caught up. And it did sound just wonderful too. Not too loud, but very deep and oh so serious.